What happened at the cross? What passed away and what didn’t? Was it just the sacrifices? Is the calendar of various holy days still in effect? These are some of the questions we will explore. What does the whole Jewish system mean for us? “Which are a shadow of things to come; but the body is of Christ.” Colossians 2:17. “The whole Jewish economy is a compacted prophecy of the gospel. It is the gospel in figures.” Reflecting Christ, p. 112:4. How did this prophecy meet its fulfillment? “Christ was the foundation of the whole Jewish economy, and in all his specific directions regarding the ceremonial observances, these were distinguished from the Decalog. They were to pass away. Type was to meet antitype in the one great offering of Christ for the sins of the world.” Signs of the Times, July 29, 1897, par. 10. What happened when the baby Jesus came into the world? “21 And when eight days were accomplished for the circumcising of the child, his name was called Jesus, which was so named of the angel before he was conceived in the womb. 22 And when the days of her purification according to the law of Moses were accomplished, they brought him to Jerusalem, to present him to the Lord; 23 (As it is written in the law of the Lord, Every male that openeth the womb shall be called holy to the Lord;) 24 And to offer a sacrifice according to that which is said in the law of the Lord, A pair of turtledoves, or two young pigeons.” Luke 2:21-24. “The priest went through the ceremony of his official work. He took the child in his arms, and held it up before the altar…. He did not think that this babe was He whose glory Moses had asked to see. But One greater than Moses lay in the priest’s arms; and when he enrolled the child’s name, he was enrolling the name of One who was the foundation of the whole Jewish economy. That name was to be its death warrant; for the system of sacrifices and offerings was waxingold; the type had almostreached its antitype, the shadow its substance.” Desire of Ages, p. 52:2. Jesus’ first exposure to the festivals was as a child, when he went up with Joseph and Mary to the Passover at Jerusalem. “41 Now his parents went to Jerusalem every year at the feast of the passover. 42 And when he was twelve years old, they went up to Jerusalem after the custom of the feast.” Luke 2:41, 42. “Among the Jews the twelfth year was the dividing line between childhood and youth. On completing this year a Hebrew boy was called a son of the law, and also a son of God. He was given special opportunities for religious instruction, and was expected to participate in the sacred feasts and observances. It was in accordance with this custom that Jesus in His boyhood made the Passover visit to Jerusalem. Like all devout Israelites, Joseph and Mary went up every year to attend the Passover; and when Jesus had reached the required age, they took Him with them.” Desire of Ages, p. 75:1. “The Passover was followed by the seven days’ feast of unleavened bread. On the second day of the feast, the first fruits of the year’s harvest, a sheaf of barley, was presented before the Lord. All the ceremonies of the feast were types of the work of Christ. The deliverance of Israel from Egypt was an object lesson of redemption, which the Passover was intended to keep in memory. 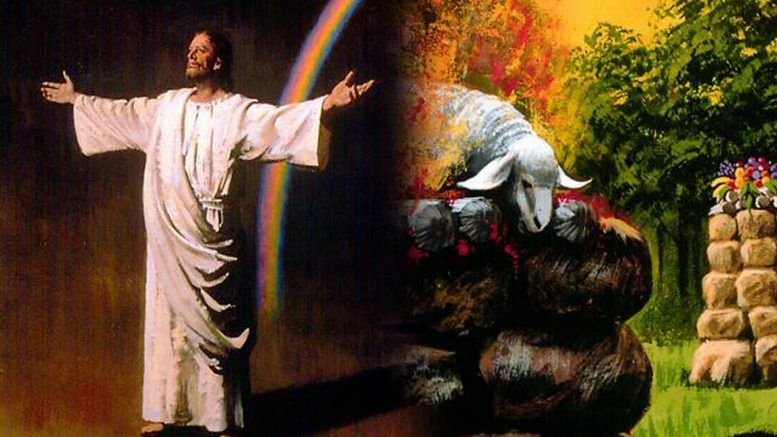 The slain lamb, the unleavened bread, the sheaf of first fruits, represented the Saviour. “With most of the people in the days of Christ, the observance of this feast had degenerated into formalism. But what was its significance to the Son of God!” Desire of Ages, p. 77:1, 2. “The Lord Jesus was the foundation of the whole Jewish economy. Its imposing services were of divine appointment. They were designed to teach the people that at the time appointed One would come to whom those ceremonies pointed…. And when the Reality came, in the person of Christ, they did not recognize in Him the fulfillment of all their types, the substance of all their shadows.” Christ’s Object Lessons, p. 34:4. What was Jesus’ prediction regarding the worship carried on at the temple? “21 Jesus saith unto her, Woman, believe me, the hour cometh, when ye shall neither in this mountain, nor yet at Jerusalem, worship the Father. 22 Ye worship ye know not what: we know what we worship: for salvation is of the Jews. 23 But the hour cometh, and now is, when the true worshippers shall worship the Father in spirit and in truth: for the Father seeketh such to worship him. 24 God is a Spirit: and they that worship him must worship him in spirit and in truth.” John 4:21-24. “Christ’s prediction regarding the destruction of the temple was a lesson on the purification of religion, by making of none effect forms and ceremonies. He announced Himself greater than the temple, and stood forth proclaiming, ‘I am the way, the truth, and the life.’ He was the one in whom all the Jewish ceremony and typical service was to find its fulfillment. He stood forth in the place of the temple; all the offices of the church centered in Himself alone. “In the past, Christ had been approached through forms and ceremonies, but now He was upon the earth, calling attention directly to Himself, presenting a spiritual priesthood, and placing the sinful human agent at the footstool of mercy…. “These lessons Christ gave in His teaching, showing that the ritual service was passing away, and possessed no virtue. ‘The hour cometh,’ He said, ‘and now is, when the true worshipers shall worship the Father in spirit and in truth: for the Father seeketh such to worship Him. God is a Spirit; and they that worship Him must worship Him in spirit and in truth.’ True circumcision is the worship of Christ in spirit and truth, not in forms and ceremonies, with hypocritical pretense.” Fundamentals of Christian Education, p. 399:1-3. What would soon happen to the worship services at the temple? “1 And Jesus went out, and departed from the temple: and his disciples came to him for to shew him the buildings of the temple. 2 And Jesus said unto them, See ye not all these things? verily I say unto you, There shall not be left here one stone upon another, that shall not be thrown down.” Matthew 24:1, 2. “Israel had been a favored people; God had made their temple His habitation; it was ‘beautiful for situation, the joy of the whole earth.’ Ps. 48:2. The record of more than a thousand years of Christ’s guardian care and tender love, such as a father bears his only child, was there. In that temple the prophets had uttered their solemn warnings. There had the burning censers waved, while incense, mingled with the prayers of the worshipers, had ascended to God. There the blood of beasts had flowed, typical of the blood of Christ. There Jehovah had manifested His glory above the mercy seat. There the priests had officiated, and the pomp of symbol and ceremony had gone on for ages. But all this must have an end.” Desire of Ages, p. 576:2. “The symbols of the Lord’s house are simple and plainly understood, and the truths represented by them are of the deepest significance to us. In instituting the sacramental service to take the place of the Passover, Christ left for his church a memorial of his great sacrifice for man. ‘This do,’ he said, ‘in remembrance of me.’ This was the point of transition between two economies and their two great festivals. The one was to close forever; the other, which he had just established, was to take its place, and to continue through all time as the memorial of his death.” Review and Herald, June 22, 1897, par. 1. What did Jesus’ death on the cross do? “26 And after threescore and two weeks shall Messiah be cut off, but not for himself: and the people of the prince that shall come shall destroy the city and the sanctuary; and the end thereof shall be with a flood, and unto the end of the war desolations are determined. 27 And he shall confirm the covenant with many for one week: and in the midst of the week he shall cause the sacrifice and the oblation to cease, and for the overspreading of abominations he shall make it desolate, even until the consummation, and that determined shall be poured upon the desolate.” Daniel 9:26, 27. “‘In the midst of the week He shall cause the sacrifice and the oblation to cease.’ In A.D. 31, three and a half years after His baptism, our Lord was crucified. With the great sacrifice 328 offered upon Calvary, ended that system of offerings which for four thousand years had pointed forward to the Lamb of God. Type had met antitype, and all the sacrifices and oblations of the ceremonial system were there to cease.” The Great Controversy, p. 327:3. “Since the whole ritual economy was symbolical of Christ, it had no value apart from Him…. In putting Christ to death, the Jews virtually destroyed their temple. When Christ was crucified, the inner veil of the temple was rent in twain from top to bottom, signifying that the great final sacrifice had been made, and that the system of sacrificial offerings was forever at an end.” The Desire of Ages, p. 165:4. “Blotting out the handwriting of ordinances that was against us, which was contrary to us, and took it out of the way, nailing it to his cross.” Colossians 2:14. “Many minds were busy with thoughts started by the scenes of Calvary. From the crucifixion to the resurrection many sleepless eyes were constantly searching the prophecies, some to learn the full meaning of the feast they were then celebrating, some to find evidence that Jesus was not what He claimed to be; and others with sorrowful hearts were searching for proofs that He was the true Messiah. Though searching with different objects in view, all were convicted of the same truth,—that prophecy had been fulfilled in the events of the past few days, and that the Crucified One was the world’s Redeemer. Many who at that time united in the service never again took part in the paschal rites. Many even of the priests were convicted of the true character of Jesus. Their searching of the prophecies had not been in vain, and after His resurrection they acknowledged Him as the Son of God.” The Desire of Ages, p. 775:1. “There is a law which was abolished, which Christ ‘took out of the way, nailing it to His cross.’ Paul calls it ‘the law of commandments contained in ordinances.’ This ceremonial law, given by God through Moses, with its sacrifices and ordinances, was to be binding upon the Hebrews until type met antitype in the death of Christ as the Lamb of God to take away the sin of the world. Then all the sacrificial offerings and services were to be abolished. Paul and the other apostles laboured to show this, and resolutely withstood those Judaizing teachers who declared that Christians ought to observe the ceremonial law.” Bible Echo and Signs of the Times, April 16, 1894, par. 2. “The ceremonies connected with the services of the temple, prefiguring Christ in types and shadows, were taken away at the time of the crucifixion, because on the 1116 cross type met antitype in the death of the true and perfect offering, the Lamb of God (MS 72, 1901).” SDA Bible Commentary, vol. 6, p. 1115:21. What happened at the resurrection? “Christ arose from the dead as the first fruits of those that slept. He was the antitype of the wave sheaf, and His resurrection took place on the very day when the wave sheaf was to be presented before the Lord.” TheDesire of Ages, pp. 785, 786. “1 And when the day of Pentecost was fully come, they were all with one accord in one place. 2 And suddenly there came a sound from heaven as of a rushing mighty wind, and it filled all the house where they were sitting. 3 And there appeared unto them cloven tongues like as of fire, and it sat upon each of them. 4 And they were all filled with the Holy Ghost, and began to speak with other tongues, as the Spirit gave them utterance.” Acts 2:1-14. “Christ’s ascension to heaven was the signal that His followers were to receive the promised blessing. For this they were to wait before they entered upon their work. When Christ passed within the heavenly gates, He was enthroned amidst the adoration of the angels. As soon as this ceremony was completed, the Holy Spirit descended upon the disciples in rich currents, and Christ was indeed glorified, even 39 with the glory which He had with the Father from all eternity. The Pentecostal outpouring was Heaven’s communication that the Redeemer’s inauguration was accomplished. According to His promise He had sent the Holy Spirit from heaven to His followers as a token that He had, as priest and king, received all authority in heaven and on earth, and was the Anointed One over His people.” Acts of the Apostles, p. 38:3. This resulted in a harvest being brought in—it was a fulfillment of the Feast of Weeks. “The work of salvation in both the Old and the New Testament dispensation is the same. Christ was the foundation of the whole Jewish economy. The types and shadows under which the Jews worshiped, all pointed forward to the world’s Redeemer. It was by faith in a coming Saviour that sinners were saved then. It is through faith in Christ that they are justified today.” Signs of the Times, February 25, 1897, par. 2. “After Christ died on the cross as a sin offering, the ceremonial law could have no force. Yet it was connected with the moral law, and was glorious.” Selected Messages, bk. 1, p. 238:1. Be the first to comment on "Two Economies Meet"